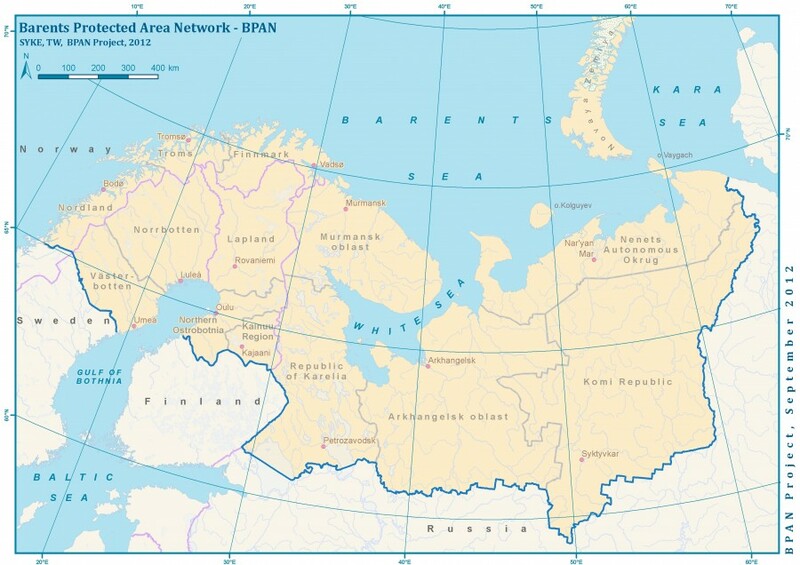 The Barents Euro-Arctic Region is a transboundary area located in northern Europe, mostly north of the Arctic Circle. It consists of 13 administrative regions in the northernmost parts of Norway, Sweden, Finland and Northwest Russia, covering a total area of 1,8 million km² of which 75% is in Russia. 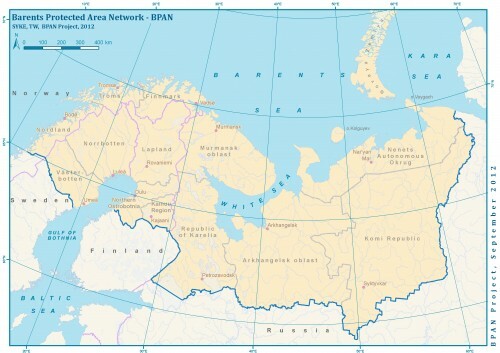 The Barents Region forms a uniform natural area connecting northern parts of Europe and Russia. Barents region is situated in the northern parts of Europe. The map is produced in the BPAN project. The Barents Euro-Arctic Council (BEAC) is a forum for intergovernmental and interregional cooperation in the Barents Region. It was established in 1993. The nature conservation subgroup of the BEAC Working Group on Environment coordinates cooperation on nature protection in the region. The Barents Region lies on adjacent tectonic structures: the Fennoscandian peninsula, the Baltic Shield and the Russian platform. Mountain ranges characterize the western parts of the Barents Region situated on the Baltic Shield, whereas plains and hills dominate the generally low relief of the eastern parts situated on the Russian platform. The Barents Region is surrounded by several seas; the Norwegian Sea in the west and the Barents Sea, White Sea and Kara Sea in the north. The largest rivers in the Barents Region are Pechora and Dvina, and the biggest lakes are Onega and Ladoga. The climate in the Barents Region varies, but in general the climate is humid with cold winters. The majority of the region is located in the continental subarctic or boreal climate zones. However, the Scandinavian Mountains, northern parts of the Kola Peninsula, Nenets Autonomous District and the Novaya Zemlya archipelago have an arctic climate. The vegetation and ecosystems in the Barents Region are diverse, including extensive areas of boreal forests, taiga, in the south, and large areas of tundra in the north. The boreal forests are divided into southern, middle and northern boreal forests; whereas the northern parts of the Barents Region and elevated areas are either artic or oroarctic. The Barents Region is extremely rich in natural resources. Only few places on Earth are equally rich in forests, fish, minerals, oil and gas. At the same time, one of the largest remaining intact natural ecosystems on Earth is situated in the boreal and arctic nature of the Barents Region.